What is a group of galaxies? A group of galaxies usually contains two or more galaxies the size of the Milky Way or larger, plus a dozen or more smaller galaxies. The Milky Way and Andromeda galaxies are the two large galaxies in the Local Group. There are a few dozen smaller galaxies in the group, including the Magellanic Clouds, the dwarf elliptical Messier 32, the small spiral galaxy Messier 33, and many small dwarf galaxies. The Local Group of galaxies is a few million light-years across. 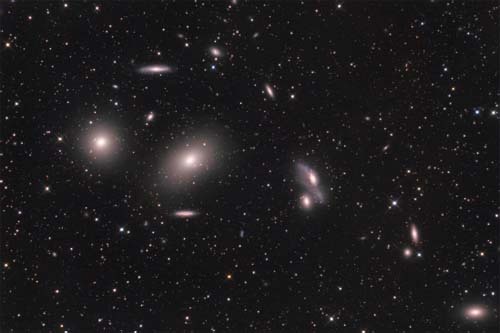 The Virgo Cluster is an excellent example of a cluster of galaxies bound together in a single gravitational field.